Foundation damage is a big deal in your home, as it provides the center of support for your entire house. If it is compromised in some way, such as via termites, you can experience structural damage that is costly to fix. Termites — ant-like bugs that feed on wood and other materials — can do a lot of destruction in just a short amount of time. While they can not eat through concrete, they can get in through small cracks in the foundation. As such, they can gain entrance to your home and begin feasting on the wooden structures that support the surrounding foundation, along with basement windows, floor joists within crawl spaces and wooden porches, according to Termites.com. Subterranean termites — which take up residence underground — are the type most likely to cause foundational damage. Be on the look out for signs of damage to the surrounding foundation work, particularly in and around floor joists and wall studs. Look for mud tubes along the walls, which signal the presence of subterranean termites that are working hard to build connections between nests and food. Often times, signs of termite damage are very similar to water damage, characterized by buckled wood and swollen ceilings or floors. You may also notice a mildewy or moldy type of smell. Because termites can get in to the walls via cracks in your concrete foundation, it is important to cut off their entry points. Consulting with a professional exterminator is the best course of action, as he or she can recommend the right solution for your individual case. To prevent and control the infestation of these bugs, this may involve the application of a liquid or foam termiticide via small drilled holes within the foundation and underneath your house. Baits may also be used, as can termite control barriers and pesticide-treated soil. Because termite damage typically goes undetected until the damage is severe, it is important to call in a pest control professional at the first signs of infestation or through regular inspections. 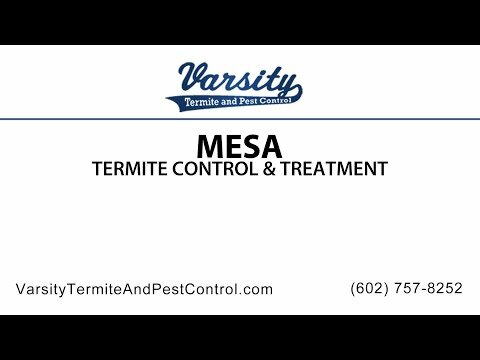 Contact us today at Varsity Termite and Pest Control located in Mesa, Arizona as we also provide services in the surrounding areas of Phoenix. Our team of professional termite control exterminators in Mesa will be extremely happy to help. If you have any questions or concerns regarding termite control, we will provide you with all the information and answers you have been looking for and need. Our other services include pest control and scorpion control. Call us today for a free estimate and termite inspection. Our team’s goal is to make sure you are satisfied with our services and you are happy to be in a safe home. Want want to ensure you that the termites or any other pest will keep away from or around your home as much as possible.